LinkedIn is fast reaching a turning point, in my opinion. Until now it has been a very ‘sticky’ site for the B2B world. But there are a few things that are turning people off. One is the rising encroachment of badly targeted advertising, often automated via retargeting software. Retargeting is what happens when you look at a product or service on one website and then find adverts for the same thing following you around the web. It’s the digital equivalent of a car showroom salesman following you home and pestering you every time you step outside – and is just as welcome. 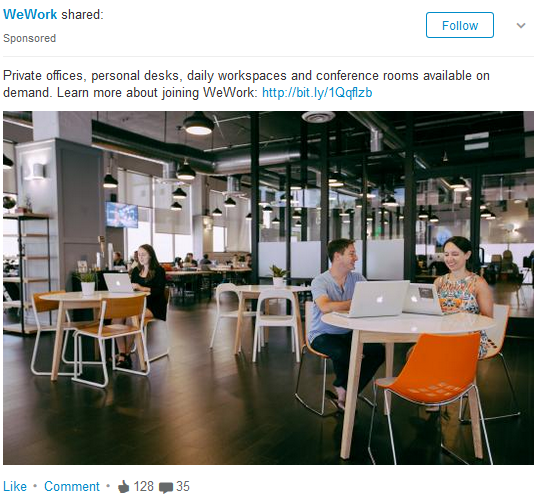 A case in point is the American company called WeWork, which rents communal, serviced offices in London and other big cities. A few months ago a company I know moved into its London location and I went to WeWork’s website to check out the address. 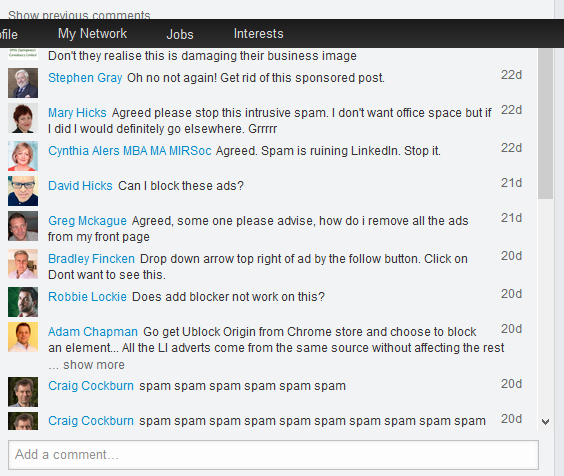 Ever since I’ve had the advert below appearing in my LinkedIn Updates stream. After a while it started to become annoying so I clicked on the option ‘I don’t want to see this’. But it still appears and seems to be unstoppable. I’m never going to be a WeWork customer, although I am certainly a potential advocate. Except that I know from direct experience that what’s on offer isn’t good enough. Its meeting rooms are so badly sound-proofed that you can overhear conversations in adjacent rooms. Apart from being irritating, this raises privacy concerns. More fundamentally, its IP-based phone system regularly fails and I’ve also heard that complaints fall on deaf ears. Worse still, it’s hard to get a mobile phone signal in the building in question. The product and service offered by WeWork is clearly not up to scratch. So perhaps it’s not so surprising that its marketing execution is equally shoddy. It’s not just the fact that WeWork’s advertising is too pushy and poorly targeted, it’s that they’re ignoring feedback from the people they’re pitching. Check out this selection of comments underneath the advert. These are just ten of 35 comments and every one of those 35 is negative. There’s a great lesson here about the inherent dangers of badly-automated, digital marketing and the law of unintended consequences. Don’t make the same mistakes in your own B2B LinkedIn promotion. More importantly, focus on getting the product or service as good as possible before you start promoting it heavily.